So many are out advocating for the rights of those who live differently than the majority, but when it comes to motherhood, that need or desire to champion differences diffuses. We’re terrified of differences. We’re fearful we will be judged for our different choices. We’re afraid we’re the one “doing it wrong.” We worry we can’t do anything right. We’re afraid we’ll have to defend or protect the choices we’ve made. 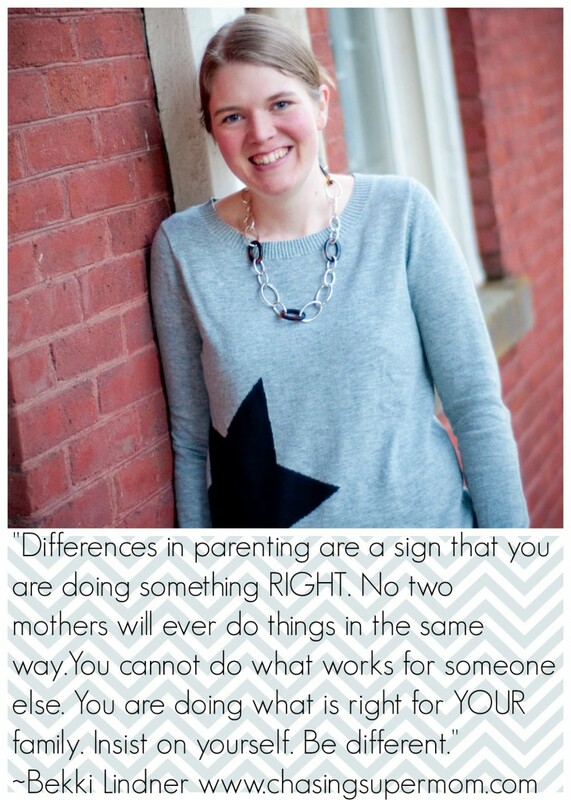 Differences – especially when it comes to parenting, can be threatening. When we learn that another mother does things in a different way, we’re immediately on the offensive or ready to play defense. My question is – why? Why are we so quick to judge or feel as though we have to defend? Can we change the way we think about parenting differences and learn to accept them? Is it possible to rally around one another, championing our inherent RIGHTS to parent in the way we see fit? Can we start a movement of mothers who are unafraid to be different? I get chills thinking about living in a world that advocates for mothers; letting each mother be the mother SHE was called and created to be. I get excited imagining mothers who live and breather and operate without judgement. I long to live in a world where a mother need not fear her differences, but rather takes great pride in them, knowing she is doing what is best for her and her family. Differences shed light on who we are as parents. We each make different choices because we are raising different children. We make different choices because we each have a unique background, situation, and set of circumstances. We’re different because we’re different! Differences in parenting are a sign that we are doing something RIGHT. When you are parenting in a different way than a friend – it means you are doing what works for YOU. You cannot do what works for her. You are unique. So must your choices be. Our goal as mothers should never be “sameness.” To attempt to copy or mimic another parent would not only be disingenuous, but a huge disservice to your family and children. We must insist on being ourselves. We must advocate for the right to parent differently. No two families will ever do things in exactly the same way. The choices that you have made as a parent are the choices that were right for you. You are beautifully and uniquely different than any other mother. Let those differences SHINE, knowing that you are doing what is best for YOUR family. Our differences are what make us great. Let them unite us, and not divide us – knowing that each of us is doing what is right, in a wonderfully different way. Take the pledge with me. Pledge to BE different – by both owning the choices that you’ve made and letting every mother reserve the right to do what works for her without question or judgement. Be different. Be you. Such a great thing to remember! I tend to over think every parenting decision I make, especially because so many people act like I’m not a “real” mom since my kiddo is actually my stepson. Thanks for the reminder that I shouldn’t be afraid to be the kind of mom I feel is right (and that my husband agrees with of course), instead of how anyone else says I should be! Great post. I’ve never been a parent and have never told a parent what they SHOULD or should not do. As an older mom/ grandma. I have lived the story of what was considered to be right years ago is now considered to be wrong and vice versa. I always figure that God will lead me to the right way to handle children and to never feel bad if I don’t do things as others feel I should so long as I am not injuring the child.